Reports of the death of organized religion have been exaggerated. According to recent research, the growth of religious populations worldwide is projected to be 23 times larger than the growth of the unreligious between 2010 and 2050. The report Changing religion, changing economies, which draws on a 2015 global study published in Demographic Research and its connected Pew Research Center report, has profound implications for the global economy. Today, seven of the G8 nations have Christian-majority populations. But by 2050 only one of the leading economies is projected to have a majority Christian population – the United States. The other mega economies in 2050 are projected to include a country with a Hindu majority (India), a Muslim majority (Indonesia), and two with exceptionally high levels of religious diversity (China and Japan). As religious diversity and religious populations grow, so does their potential impact, creating new challenges and opportunities for societies, governments and economies. The impact of religion is on the rise on a global scale. By the middle of this century, the number of people affiliated with a religion is expected to grow by 2.3 billion, from 5.8 billion in 2010 to 8.1 billion in 2050. By contrast, the number of people unaffiliated with any religion (including those who say their religion is “nothing in particular” as well as self-identifying agnostics and atheists) is projected to increase by only 0.1 billion, from 1.13 billion in 2010 to 1.23 billion in 2050. In terms of population shares, this is significantly lower than the peak in the 1970s under communism when nearly one in five people worldwide were religiously unaffiliated, according to the World Religion Database. The growth of religious populations also has implications for how the world’s wealth will be spread about. The economic transformations of China and India are common knowledge. But what is less well known is that the five leading economies of 2050 are projected to represent one of the most religiously diverse groupings in recent memory. Below are the main takeaways of global religious and economic change, ordered by the projected size of religious groups in 2050. The growth of the global Christian population is projected to be about the same rate as overall global population growth between 2010-2050. The largest share of the world’s Christians lived in the Americas as of 2010, while the largest share of Christians is expected to be in Sub-Saharan Africa by 2050. Economic growth among the global Christian population is expected to increase, but be significantly less than economic growth in the world as a whole. In the years ahead, the global distribution of economic influence associated with Christian populations is expected to remain largely dominated by the Americas, with Europe slightly decreasing in influence and Sub-Saharan Africa and Asia-Pacific regions slightly increasing. The number of Muslims in the world is expected to nearly double between 2010 and 2050 and Muslims are expected to lead the world in population growth compared with other religious groups. The largest share of the world’s Muslims lived in the Asia-Pacific region as of 2010 and will continue to live in this region in the decades ahead. Economic growth among the global Muslim population is expected to significantly outpace global economic growth. India is expected to have the largest Muslim population of any country in the world by 2050, surpassing Indonesia. In the years ahead, slightly more than half of the economic influence associated with Muslim populations is expected to be in the Asia-Pacific region, with India’s economic overall growth also helping to add some to the global economic resources of Muslims. 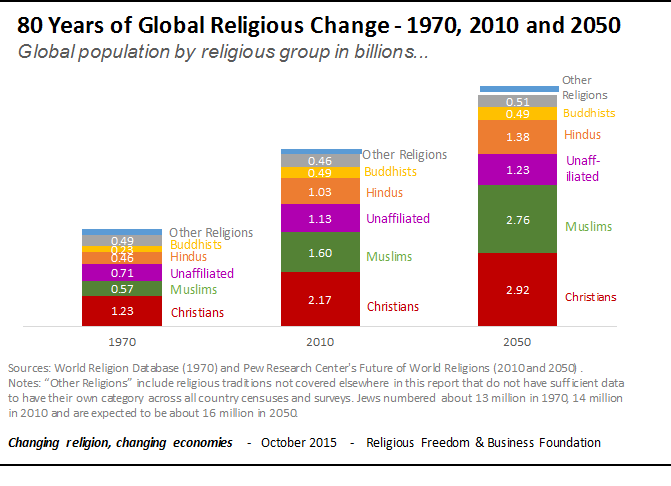 The growth of the global religiously unaffiliated population is slowing at a much faster rate than global population growth. The largest share of the world’s religiously unaffiliated population lived in the Asia-Pacific region as of 2010 with over half of the entire world’s unaffiliated people living in China. Population growth of the religious unaffiliated population in the Americas is expected to be substantially higher than growth in other regions of the world. Economic growth among the global religiously unaffiliated population is expected to be on par with global economic growth in the years ahead. The global distribution of economic influence associated with religiously unaffiliated populations is expected to grow in the Asia-Pacific region, with economic influence decreasing slightly in Europe and the Americas. The number of Hindus in the world is expected to grow by 400 million people between 2010 and 2050, but is projected to remain about the same share of the world’s population in the decades ahead. The largest share of the world’s Hindus lived in the Asia-Pacific region (notably India) as of 2010 and will continue to live in this region in the decades ahead. Economic growth among the global Hindu population is expected to significantly outpace global economic growth, mostly led by the rising economy of India. The vast majority of economic resources available to Hindus lies in India, but Hindus in the United States and the United Kingdom also contribute significantly to the global economic resources available to Hindus. The number of Buddhists in the world is expected to remain at nearly 500 million between 2010 and 2050, but is projected to decrease as a share of the world’s population. The largest share of the world’s Buddhists lived in the Asia-Pacific region (notably China) as of 2010; they are estimated to continue to live in this region in the decades ahead. Despite the stagnation of population growth among Buddhists, economic growth among the global Buddhist population is expected to be on par with global economic growth, largely due to China’s economic rise. China and Japan jointly hold nearly all of the world’s economic resources available to Buddhists, but this study estimates that Buddhists in the United States also contribute significantly to the global economic resources available to Buddhists. The growth of the global Jewish population is slowing more quickly than the world overall; however, the number of Jews is still anticipated to be about two million more in 2050 than in 2010 (increasing from about 14 million in 2010 to slightly more than 16 million worldwide in 2050). The largest share of the world’s Jews lived in the Americas (mostly in the United States) as of 2010, while the largest share of Jews is expected to be in the Middle East-North Africa region (namely Israel) by 2050. Economic growth among the global Jewish population is expected to increase, but be significantly less than economic growth in the world as a whole. In the years ahead, the global distribution of economic influence associated with Jewish populations is expected to slightly decrease in the Americas with corresponding slight increases among Jewish populations living in the Middle East- North Africa region. The number of people belonging to other religions in the world is expected to grow by about 30 million people between 2010 and 2050, but is projected to decrease as a share of the world’s population. The largest share of the world’s other religious populations lived in the Asia-Pacific region (notably China) as of 2010 and will continue to live in this region in the decades ahead. Despite its slow population growth, economic growth among people belonging to other religions is expected to outpace global economic growth, largely due to China’s projected economic growth. China holds about two-thirds of the global economic resources available to other religions. * Other religions include religious traditions not covered elsewhere in this report. Data limitations prevent their individual analysis on a global basis. They are included, however, to account for all people worldwide, recognizing that the results have limited information for any one particular group. These religions include folk religions often identified along ethnic lines and sometimes mixed with local beliefs of other major religions. Examples of these folk religions include traditional African religions and Chinese ancestral belief systems. The other religion category also includes groups like Baha’i, Jainism, Shintoism, Sikhism and Taoism that do not have sufficient data to have their own category across most country censuses and surveys.